Gemstone bracelets can be colorful and sparkling, they can also have meaning and significance depending on the gems set in the jewel. 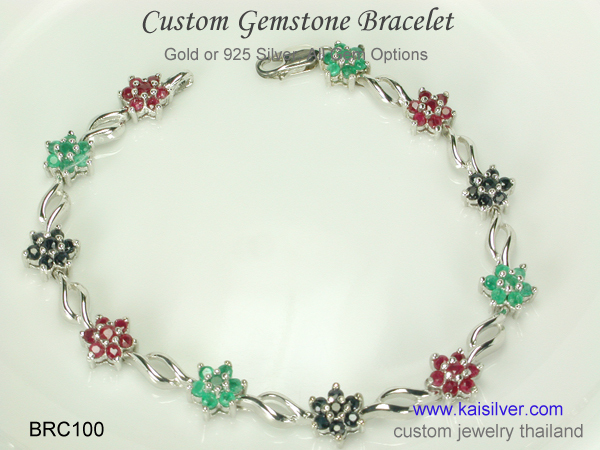 The BRC100 custom bracelet from Kaisilver is an awesome jewel, a piece that quality conscious jewelry and gem lovers will low to wear. The bracelet is shown here with three of the most sought after gems in history, ruby, sapphire and emerald. You can however, order this gold or silver bracelet with gems of your choice. The elegant flower based concept for this piece is supported with a sturdy construction, we have lavished 20-25 grams of gold or silver in this jewel. The bracelet is a spectacular accessory suitable for the most formal occasion and yet, wears a price tag that is surely reasonable. Kaisilver artisans work with unwavering dedication and concentration, this is true for both silver and gold gemstone bracelets. Custom made bracelet in gold or 925 silver, good workmanship for both metals. A good metal weight of 20-25 grams makes the jewel sturdy and long lasting. All gem options are available, you can combine and mix gems of your choice. 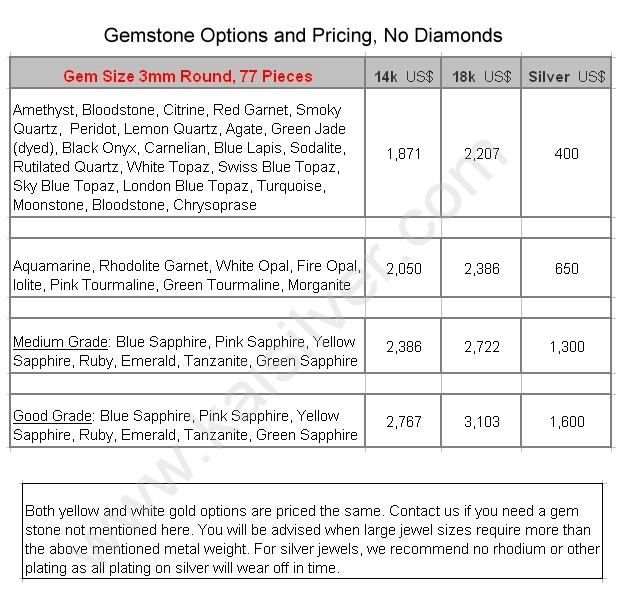 The gemstones are natural and 3mm rounds, no limitation on gem selection. Read below for the diamond options available for the BRC100 bracelet. 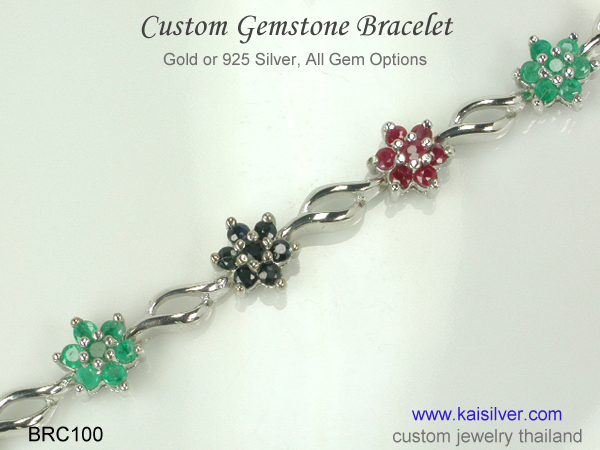 The Kaisilver bracelet is shown here with ruby, sapphire and emerald gems. For the gold option, choose white, yellow or pink gold in 14k or 18k gold. Price for 10k gold bracelet can be provided on request, please email us. 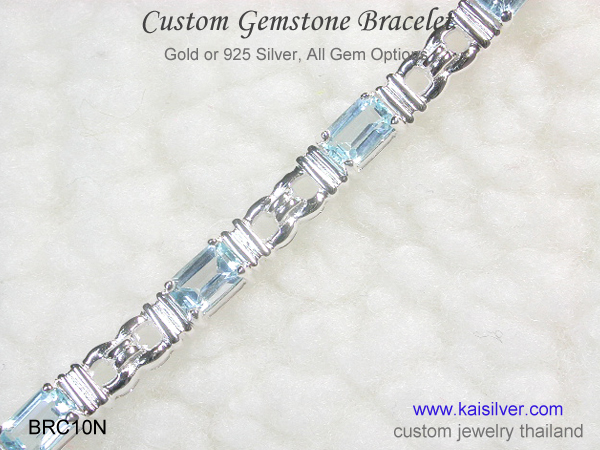 Sterling silver gemstone bracelets can be provided with or without plating. All types of plating done on silver, will wear off after some time. You can request for the required length for your silver or gold bracelet. 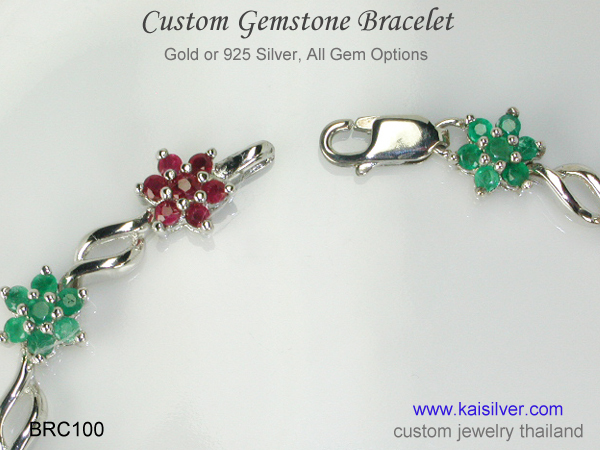 Skilled artisans work on all Kaisilver jewelry, gems are handpicked by experts. 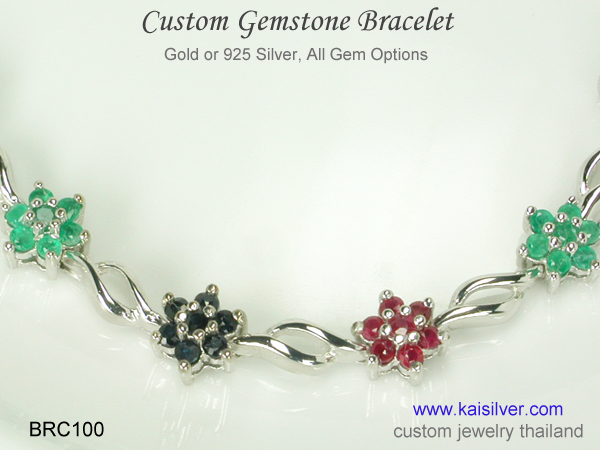 Gemstones: You can choose the gems of your choice when ordering this custom bracelet in gold or sterling silver. The jewel as shown here is encrusted with natural rubies, emeralds and sapphires. You could request for a made to order bracelet with just one type of gemstone too, the choice is yours. Ruby and sapphire belong to the same mineral family corundum, historically and until today, these gorgeous gems have been highly sought after. Love, status, royalty and aristocracy have for centuries been the hallmark of these gems. The rarity of gem quality rubies and sapphires is clearly evident today, gem lovers are willing to pay and prices never stop moving upwards. Ruby denotes true love and affection, it also encourages success in professional life. Besides being the birthstone for the month of July, ruby also holds two prominent positions on the anniversary gemstone charts. You can celebrate the 15th and 40th anniversaries by wearing this scintillating red gemstone. Sapphire the September birthstone, symbolizes truth and honesty, the gem is believed to bestow a clear mind and thought process to its wearer. Sapphire marks the 5th and 45th anniversaries on the charts. Emerald the gemstone of harmony and reconciliation is recommended by most crystal healers, whether it is domestic conflict or professional egos emerald is believed to soothe them all. The green beauty is marked by natural inclusions and fissures, somethings that are accepted even by the most learned gemologists. Together, ruby, sapphire and emerald are referred to as the 'Big Three' of the gemstone world. Diamonds: So what if you wanted a custom diamond bracelet with this concept. There are a few interesting ideas put forward by our stylists, review them and then communicate your requirements with the Kaisilver expert team. For reasons of budget, you could have the BRC100 bracelet with all 2.5mm diamonds. That is indeed a lot of glitter but fine, if you can handle all that flash and have a budget to match. Another option would be to pick gemstone flowers as per your choice of gems and then, have a 2mm or 2.5mm diamond sparkling in the center of each flower. This option is not just more moderately priced, it also combines a colorful experience with the fire of diamonds. If you prefer to have a 2mm diamond in the center of each flower, please add another 500 U.S$ to the above prices. We can also do this bracelet concept with only diamonds, 2.5mm round diamonds are suggested. All gem combinations are allowed and you need not be restricted by what is shown or listed on our websites. How To Buy: To begin with we are not the usual 'Express Buy', 'Quick Checkout'online portal. If anything on our website interests you or, you wish to have a specific gem or custom made jewel or probably, just have a question to ask related to gems and jewelry - contact our experts at sales@kaisilver.com . Our team is trained to provide help and suggestions and evaluated based on, quality of solutions provided. You will not feel any selling pressure, we therefore suggest that you keep taking advantage of our expertise. Once you have an item in mind or have your own design image or sketch, send us details along with your choice of gold or 925 silver, the gemstones preferred and any specifics regarding size etc. Our team will work on pricing details and also make constructive suggestions if any. The production time for a custom jewel is generally, around 4 to 6 weeks from the date of order confirmation and receipt of payment. Paypal is our preferred mode of payment but we also accept Western Union. If you are a first time buyer, we recommend Paypal. Let us know your preferred mode of payment and we will provide details for the same. Shipping is through FEDEX with web tracking, a shipping charge of 35 U.S$ generally covers shipping to all destinations across the globe. The team will let you know if we can bear the shipping expense for your order, this information will be provided to you before the order is confirmed with payment. Kaisilver: As one of the leading online provider of high end custom made jewelry, we at Kai Silver craft both gold and sterling silver jewelry with the same quality standards. We can work with your design concept or you could, pick a style from our websites and request for design modifications to personalize the jewel to your liking. There is no limitation placed on gemstones or design, few jewelers can provide such a high degree of customization. Contact our experts at sales@kaisilver.com with any requirements or queries that you might have.